The majority of the people in Ancient China were peasant farmers. Although they were respected for the food they provided for the rest of the Chinese, they lived tough and difficult lives. The typical farmer lived in a small village of around 100 families. They worked small family farms. Although they had plows and sometimes used animals like dogs and oxen to do the work, most of the work was done by hand. Farmers had to work for the government for about one month each year. They served in the military or worked construction projects like building canals, palaces, and city walls. Farmers also had to pay a tax by giving the government a percentage of their crops. The type of food that people ate depended on where they were living. In the north the main crop was a grain called millet and in the south the main crop was rice. Eventually rice became the main staple for much of the country. Farmers also kept animals such as goats, pigs, and chickens. People that lived close to the rivers ate fish as well. Life was much different for those living in the city. People in the cities worked a variety of jobs including merchants, craftsmen, government officials, and scholars. Many cities in Ancient China grew very large with some having populations totaling hundreds of thousands of people. The cities of China were surrounded with formidable walls made from packed dirt. Each night the city gates were locked shut and no one was allowed to enter or leave the city after dark. The Chinese family was ruled by the father of the house. His wife and children were required to obey him in all things. Women generally took care of the home and raised the children. Marriage partners were decided by the parents and the preferences of the children getting married often had little impact on the parent's choice. A big part of Chinese family life was the respect of their elders. Children of all ages, even grown ups, were required to respect their parents. This respect continued even after people were dead. The Chinese would often would pray to their ancestors and offer sacrifices to them. 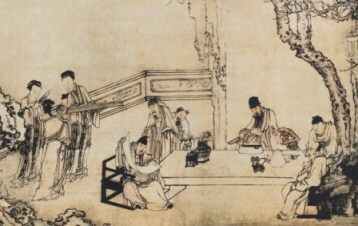 Respect of the elders was also part of the religion Confucianism. Only wealthy boys attended school in Ancient China. They learned how to write using calligraphy. They also learned about the teachings of Confucius and studied poetry. These were important skills for government officials and the nobles. The life of women in Ancient China was especially difficult. They were considered much less valuable than men. Sometimes when a baby girl was born she was put outside to die if the family didn't want it. This was considered okay in their society. Women had no say in who they would marry. Merchants were considered the lowest class of workers. They were not allowed to wear silk or ride in carriages. Young girls had their feet painfully bound to prevent their feet from growing because small feet were considered attractive. This often caused their feet to become deformed and made it difficult to walk. Three generations (grandparents, parents, and children) usually all lived in the same house. Most homes in the city had a courtyard in the middle that was open to the sky. Tea became an important part of Chinese culture around the 2nd century. It was called "cha".